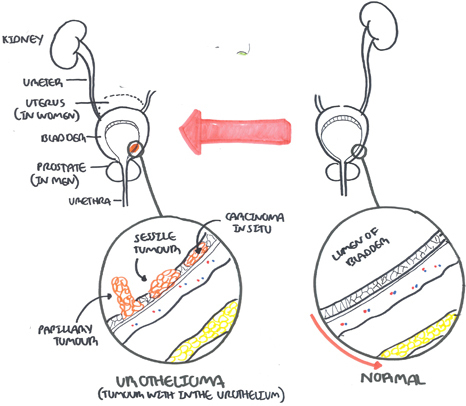 Overview Transitional cell tumours can affect any part of the urinary epithelium. 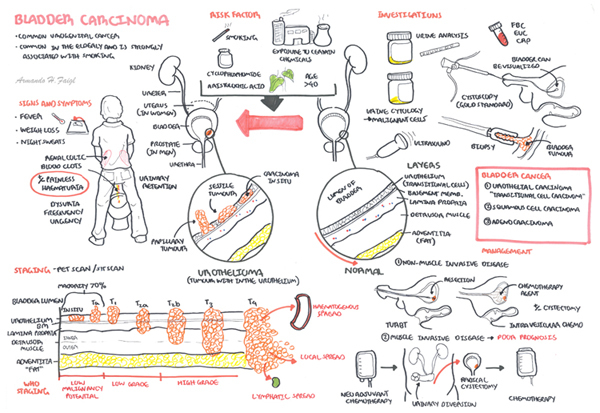 It is the second most common urological malignancy (Renal Adenocarcinoma is the most common, bladder adenocarcinoma is rare) and is one of the most common cause of cancer related death. Bladder cancer occurs most commonly from the fifth to seventh decades of life and is more common in men. Transitional cell tumour is also known as urothelial carcinoma and has a broad spectrum of morphology from low grade, sea weed looking, superficial papiliferous growths to invasive, solid mass. Transitional cell Tumours (TCT): Spectrum of disease from benign superficial growths to invasive carcinomas. 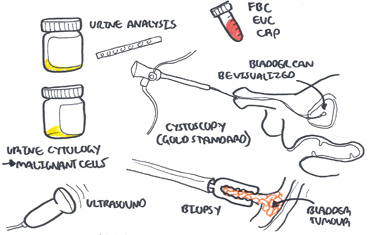 TCTs may affect any part of the urinary epithelium (bladder, ureter). 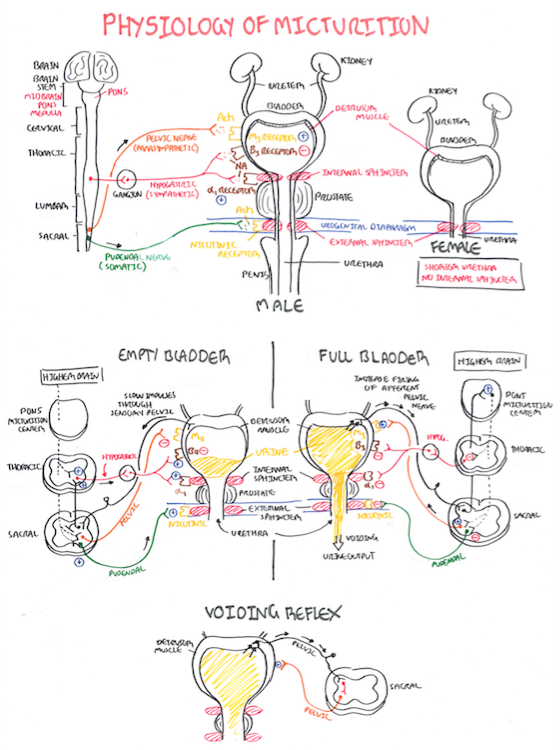 Side note Transitional epithelial cells are found in the bladder, ureter and part of the kidneys and urethra. Therefore transitional cell carcinoma can occur in any of these areas. An empty urinary bladder sits behind the pubic symphysis, when filled the bladder rises and is higher and can be readily palpated and percussed. In children the urinary bladder sits higher normally. Extending of the dome of the bladder to the umbilicus is the median umbilical ligament, a fibrous cord that represents the obliterated urachus. Side note All patients with macroscopic haematuria or persistent microscopic haematuria should be referred to a urologist for evaluation. Postcystectomy patients require 6 monthly contrast enhanced abdominal and pelvic CT scans and chest X-ray (or CT). Renal function should also be monitored as strictures can occur in the anastomosis between ureter and ileal conduit or neobladder. 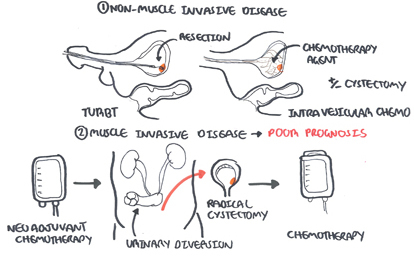 Sharma, S, Ksheersagar, P & Sharma, P 2009 Diagnosis and treatment of Bladder Cancer, American Family Physician, vol. 80, no. 7, pp. 717-723.